Emphasize the importance of the trust documents you've prepared for your clients. Deliver them in our economical Lever Arch Binders. 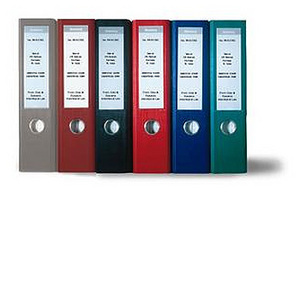 These professional binders will provide your client with a place to preserve and protect these important records. Index tabs allow the client to file other related documents such as insurance policies and financial information. They can facilitate future communications with your client by simplifying access to the documents. Each Lever Arch trust portfolio comes with detailed questionnaires to simplify the gathering of information for the estate or trust documents. The publisher of the popular DL Document Assembly Libraries has given us permission to provide these valuable questionnaires on a 3 1/2" disc in Word and Wordperfect. Use it to personalize and edit the questionnaires to suit your needs. The questionnaires cover estates under and over $500,000 with testamentary trusts and asset summary (14 pps. ), or intervivos trust, revocable and irrevocable (10 pps.). You can similarly organize your own estate records for each client using our low cost and highly efficient Lever Arch Binder and estate administration index.